As New Zealand’s oldest city and its second largest, Christchurch has long been a popular destination for visitors and settlers alike. Known as the gateway to South Island, it is set in a sweeping bay flanked by the shimmering Pacific waters to the east and the rolling Canterbury plains to the west. This is an area of outstanding natural diversity, with watersports, marine life and wineries right on your doorstep, and the adventurous snow pursuits of the Southern Alps just a two-hour drive away. Set in an area of frequent seismic activity, known as the Pacific Ring of Fire, Christchurch was rocked by a powerful earthquake in February 2011, destroying much of the central urban area. While this has had a devastating impact on the city, the speed with which Christchurch has set about rebuilding and enhancing its inner city is a shining example of triumph over adversity. New shops, businesses and leisure initiatives are springing up all the time and a coordinated plan for the reconstruction of buildings and infrastructure is ensuring that the city emerges a stronger, greener, happier environment than ever before. Visitors and new arrivals receive the warmest of New Zealand welcomes and with the vast majority of its inhabitants describing themselves as being of European origin, British expats in particular are quick to find themselves very much at home. Perhaps unsurprisingly, there is currently huge demand for individuals in the construction sector as Christchurch continues with its rebuilding plan. Quantity Surveyors, Project Managers and Engineers are all on the skills shortage list for the region, as well as certain trades such as painters, carpenters and plasterers. The Canterbury Skills Shortage list specifies the full range of occupations that are currently needed to help Christchurch with its economic recovery, and those who meet requirements and can secure a job offer in advance of their arrival are well placed to secure the right to work temporarily or permanently in New Zealand. While the rebuild fuels a boom in Christchurch’s job market, the city’s traditional employment sectors also continue to fare well. Agriculture has long been the mainstay of the city’s economy and the country’s leading agricultural business, PGG Wrightson, is based here. Dairy farming, cropping, meat processing and agriculture-based biotechnology are big business, while the wine industry is also developing fast. After Auckland, Christchurch is the second-largest manufacturing centre in the country, and its small-but-growing technology industry is known for its innovation and entrepreneurial spirit. As the city continues to recover, it is likely that opportunities in these sectors will increase. Salaries for structural engineers in the city range between $62,000 and $115,000 while .NET and java developers in the IT sector can expect to earn between $48,000 and $85,000. Typical wages for a graphic designer are between $45,000 and $60,000. New Zealand relies heavily on imports, and with a relatively small population it has limited buying power on the world market. Couple this with a weak currency and a 15% national tax levied on all purchases, and the cost of living in New Zealand is higher than in some other major cities. In Wellington and Auckland this is rebalanced somewhat by lower accommodation costs, but with the current shortage of accommodation in the city, this is less of a benefit in Christchurch. Nevertheless, in comparison to its domestic counterparts, the cost of living in Christchurch remains relatively low, with overall consumer prices including rent standing at 9.44% lower than in Auckland. Basic utilities cost around $140 per month, a monthly travel pass is in the region of $100 – the same price as a three-course meal for two in a mid-range restaurant – and a cinema ticket costs on average $16. Despite the accommodation shortage, rental properties are also cheaper than Auckland with a one-bedroom city-centre apartment costing an average of $1,350 and a three-bedroom equivalent $2,200, while away from the centre prices are nearer $1000 and $1,900 for a one-bedroom and three-bedroom apartment respectively. Whether you are looking to rent or buy when you arrive in Christchurch, you will find accommodation in the city is at a premium. More people than ever before are living outside the city centre, either permanently or temporarily while their properties are being repaired, keeping prices high in the suburbs as well as the in-demand city-centre areas. For buyers there is considerable competition both for resale and new-build properties and prices are rising accordingly. Average prices in the Addington, Somerfield and Spreydon areas rose from $310,000 to £376,000 from May 2012 to May 2014 while in the Fendalton, Merivale and Ilam neighbourhoods average prices rose from $510,000 to $638,000 in the same period. For those relocating to Christchurch a weak NZ dollar offers plenty of spending power but it is important to balance this against the likelihood of prices levelling out as construction of many new homes continues apace. Family Friendly: Located less than half an hour’s drive from the city centre, the beach-side suburb of Sumner is a popular choice for families in search of a tranquil escape from the bustle of central Christchurch. Although many of the local shops and eateries were damaged by the earthquake, it remains a charming enclave while nearby Ferrymead caters for retail and entertainment needs. Upmarket: Fendalton has long been the home of Christchurch’s old-moneyed residents. If a big home with an equally big price tag is on your agenda, the tree-lined avenues of Fendalton are where you will find it. Hip & Trendy: Riccarton and Ilam on the western side of Hagley Park have become popular venues since 2011. If you are looking for shopping, food and entertainment on your doorstep this is the place to start. 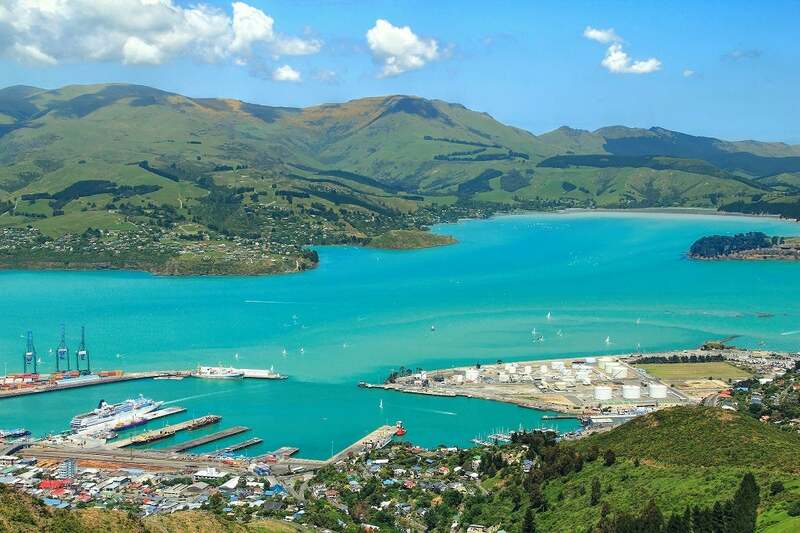 Up & Coming: Lyttleton sustained severe damage in 2011 but this attractive port village has much to offer and is amongst the first of the out-of-town areas to be scheduled for rebuilding. With new life breathed into it, it promises to soon be more sought-after than ever before. Beginning a new life in Christchurch requires some careful thought when it comes to deciding what to do with your belongings. If you are planning to bring the full contents of your home, you will want to transport your goods by sea in order to obtain the most competitive transport rates, as prices are calculated by volume rather than by weight. If, however, you are planning to travel light it may be possible to use an air-freight provider in order to be reunited with your important possessions as quickly as possible. Although badly damaged, the port at Lyttleton, a short drive from central Christchurch, remains in operation, meaning that transport costs from port to your new home will be lower than to many other South-Island destinations. Filling a 40-ft container is the most cost effective shipping method, and will cost between $10,500 and $16,000 depending on its city of origin and whether insurance, permits and other extras are included. Don’t forget to factor in the cost of flights for you and any accompanying family members too. There are currently over 150 schools in Christchurch and the surrounding area serving approximately 57,000 children. Schools are a combination of state, state-integrated (partially funded) and private and are attended by approximately 77%, 15.5% and 7.5% of children respectively. Most state schools are zoned, meaning that they automatically offer places to students who live within their catchment zone. As in other countries this has the effect of raising house prices in the zones of the most successful schools while values often remain lower elsewhere. English public schools have an enviable reputation worldwide and several of Christchurch’s schools embrace this tradition. With quintessentially English names such as St Bede’s College, Christ’s College and St Thomas of Canterbury College, these old-style institutions offer a good-quality private education for upwards of $14,000 per year. If you have older children or are considering returning to education, there are a number of further and higher education institutions including the University of Canterbury, Lincoln University, Christchurch Polytechnic Institute of Technology and the University of Otago Christchurch School of Medicine and Health Sciences. While the ‘new’ Christchurch remains a work in progress, the city nonetheless offers an excellent quality of life for those who choose to call it home. With its temperate climate, living in Christchurch can feel very similar to living in parts of northern Europe, albeit with a stunning Pacific backdrop. The city enjoys more sunny days per year than London and suffers far less congestion and traffic pollution, and whilst perhaps lacking in terms of cultural highlights, it is nonetheless home to a thriving music scene. In a comparison of 18 cities in Oceania, Christchurch ranked 2nd cheapest for buying eggs and Nike running shoes while it was the 3rd most expensive for buying fresh chicken and levis jeans. Overall consumer prices including rent are 16.87% lower in Christchurch than in Melbourne and 0.74% higher than in Rome. With much of Christchurch’s charm drawn from its spectacular natural surroundings, it is no wonder that despite the trials of recent years it remains a popular destination for visitors and permanent residents alike. One of the easiest ways to enjoy its outdoor charms is by taking a stroll through the 30 riverside hectares that make up the city’s Botanic Gardens or wandering along the waterside paths that wind adjacent to the Avon River. For an alternative view of the city many residents enjoy a ride in the upgraded cable car to the crater summit of Mount Cavendish that towers over the cityscape. Here you can enjoy fresh air and sweeping views as well as some retail therapy and lunch in the newly constructed leisure complex. With the last of the red cordons finally lifted from the Central Business District Christchurch’s city centre is once again beginning to buzz, as the temporary container units make way for permanent shops, bars and restaurants to entertain the growing population. If you are in search of a booming metropolis or a 24-hour party city Christchurch may not be top of your list but if spark, determination and warmth are what you value, Christchurch may well be at the top of the pile.